So, through hook or by crook, I’ve been trained to dangle from a helicopter as a rescue technique. How, may you ask, did that get me to the Olympics? A few years ago, Vancouver won the bid for the Olympic Games. Now I’d like to go on the record that I think we’ve been lied to and sold a bill of goods; the Olympics is a big party for a lot of international bigwigs and their friends, all paid for by us, the tax payers. I’m all for athletics, and have huge respect for the athletes and their dedication to their sport, but I believe that they too are pawns in the game; under-appreciated, under-funded and once every four years used for for a huge advertising opportunity. However, it’s too late to bother with all of that now, the preparations are done and we may as well enjoy what we’re paying for. In many respects, it’s not better a cheat than many other features of modern life, and it doesn’t do as much harm as certain other large corporations. The Olympics and I are officially OK with each other. 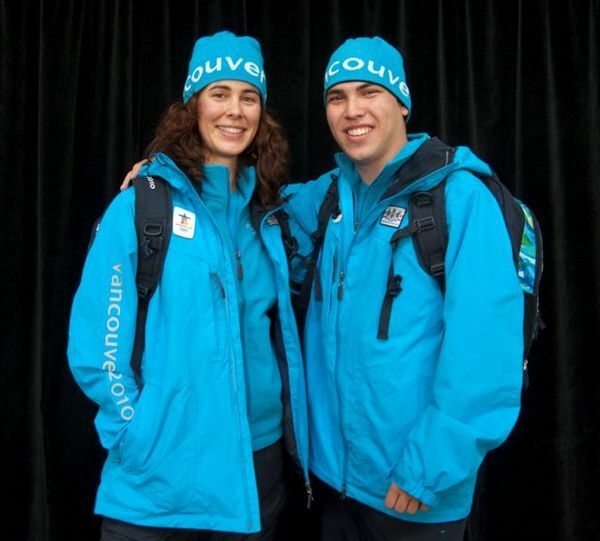 So two years ago (Feb, 2008) an email went out through the SAR community asking for volunteers to come forward for the World Cup event being held in Whistler in preparation for the games. I was told that every host city for the winter Olympics has to host a test event in the years prior to the games, one for each venue or sport. This was the test event for the Olympic downhill course. Naturally I said sure, I’d give it a try. It was an opportunity for some free training and a chance to see the big show. The way it worked was this: if a racer was injured on the course, the ski patrol and medical personnel would attend the site and stabilize the subject. We would fly in with one of us attached to the line about 150 feet under the helicopter, and be lowered to the site. The subject would be put into a bag, attached to the line, and we would fly away, directly to the medical clinic. The rationale for this was twofold; the injuries sustained by a subject crashing at about 120 km/h can easily be life threatening, and speed of treatment can make a difference. The second reason was security; everyone agreed that transporting the subject via helicopter did not breach the perimeter and was easier and safer overall. So we trained, and we executed the plan; nobody got hurt, nobody needed rescuing. Lots of Olympic officials observed, and everyone agreed that the helicopter rescue component was a good idea, and necessary. Then 2 weeks later this happened in Kvitfjell, Norway. Austrian skier Matthias Lanzinger fell during a Super-G run. In the video you can see the left ski does not release, which results in devastating damage to his leg. What happened is that his leg broke in the first part of the fall. The broken leg did not provide enough resistance to trigger the binding to release. He ultimately had to have the leg amputated below the knee. The interesting part of this particular accident is that the ski patrol on the course loaded him into a sled and carried him down the course. This is standard for most accidents. However, the Austrian press was very critical of this action, questioning why a helicopter was not ready at the course. Thankfully, at the Winter Olympics a helicopter will be available. Myself, 4 other rescuers and a pilot will be stationed (in shifts) about a hundred meters from the end of the course throughout the downhill training and race events. If a racer falls on any part of the upper course, we will sling in and extract them. If a racer is critically injured on any part of the course, we will extract them from where ever they are. They will be flown directly to the Whistler, or if necessary directly to Vancouver General Hospital. The helicopter we’re using is rigged with all seats removed and a stretcher rig ready to go. On a less serious note, if anyone hasn’t seen the volunteer uniform, this is what it looks like. 1 Pings/Trackbacks for "My Olympic Sport (Part 2)"